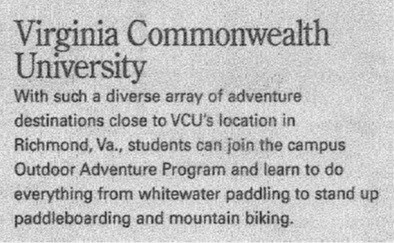 VCU’s recognition in the magazine is a result of the university’s oustanding efforts to make outdoor activity accessible and affordable to each of its students. This feature adds to a growing list of accolades that has established Richmond as one of the country’s premier outdoor destinations. The Outdoor Adventure Program serves VCU students, faculty, staff, alumni and guests by providing low-cost outdoor activity-based trips, including whitewater rafting, kayaking, rock climbing, canoeing, caving, hiking, backpacking and skiing.